Paddle Boarding Charter located in Juneau Alaska. Call 907-419-4474. 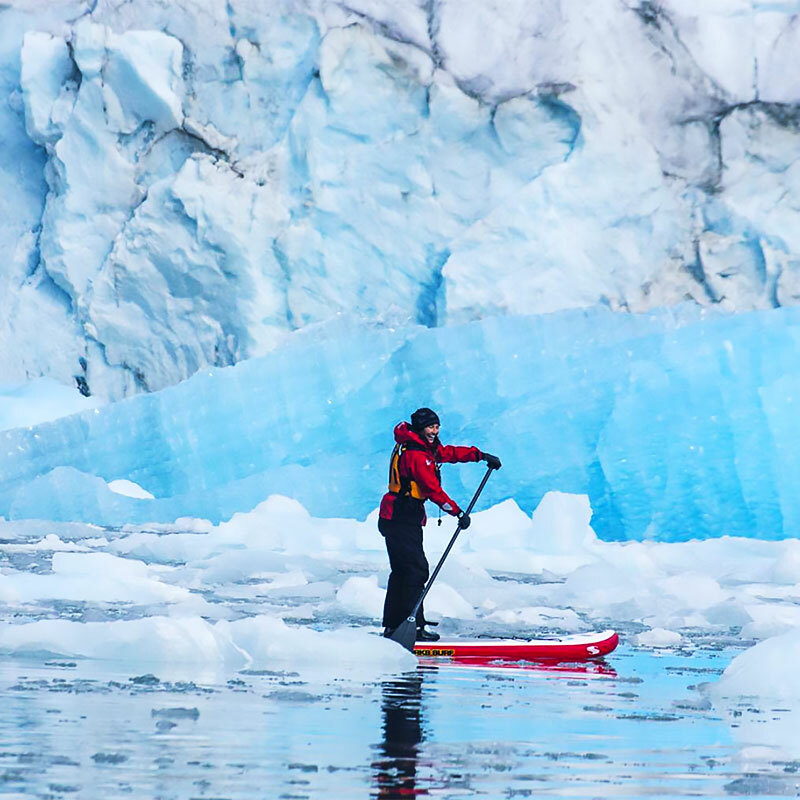 Our experienced paddleboard instructor Michelle Eshpeter leads participants on epic Alaska paddling adventures. You'll enjoy paddling with new friends in the breathtaking wilderness and magical waters of Alaska. Waterfalls drop thousands of feet off the granite mountains, and sapphire-blue icebergs serenely float by in the emerald green water. At Ford's Terror Wilderness, steep mountains surround us on all sides. Glaciers have carved their way through these granite mountains. Red Bluff Bay is a secluded jewel. We encounter dozens of small waterfalls, and one spectacular waterfall that roars into the bay. After each action-filled day, you'll unwind in luxurious comfort aboard Glacier Bear. Massive glaciers can release enormous sapphire-blue icebergs, which serenely float by in the emerald green waters. Join our Women's Paddleboard Retreat or Mixed Paddelboard Adventure in 2019, and you'll paddle in astonishing mystical waters. Our schedule is filling quickly. Please contact us soon to reserve your eight-day Women's Paddleboard Retreat or Mixed Paddleboard Adventure. The rugged Alaska coast offers limitless opportunities for uncrowded, pristine paddling adventures. On our Women's Paddleboard Retreat, you'll experience hiking, kayaking, whale-watching. Each day offers exceptional paddling in the astonishing blue-green waters of calm coves and bays, and among haunting icebergs adrift in mystical fjords. Join us on this eight-day paddling expedition. You'll enjoy observing the amazing wildlife and breathtaking scenery of Southeast Alaska, home to eagles, black and brown bears, humpback whales, orcas, Stellar sea lions, sea otters, Dall's porpoises and harbor seals. The 95' Glacier Bear offers an outstanding platform from which to launch your adventure, and a nice warm place to relax after daily sessions. The Crew will pamper you, while the Captain maneuvers Glacier Bear to place you in the perfect location. On our 2020 Paddleboard Adventure (Men/Women), you'll have endless opportunities for an uncrowded, pristine paddling adventure. Each day features exceptional paddling in the astonishing blue-green waters of calm coves and bays, and among haunting icebergs adrift in mystical fjords. The rugged Alaska coast also creates an unparalled opportunity for hiking and kayaking excursions. Along the way, we'll observe Alaska's magnificent humpback whales. Join us on this eight-day paddling expedition. You'll enjoy viewing the amazing wildlife of Southeast Alaska, home to eagles, black and brown bears, humpback whales, orcas, Stellar sea lions, sea otters, Dall's porpoises and harbor seals. The 95' Glacier Bear offers an outstanding platform from which to launch our adventure, and it's a nice warm place to relax after daily sessions. The Crew will pamper you, while the Captain maneuvers Glacier Bear to place you in perfect locations. 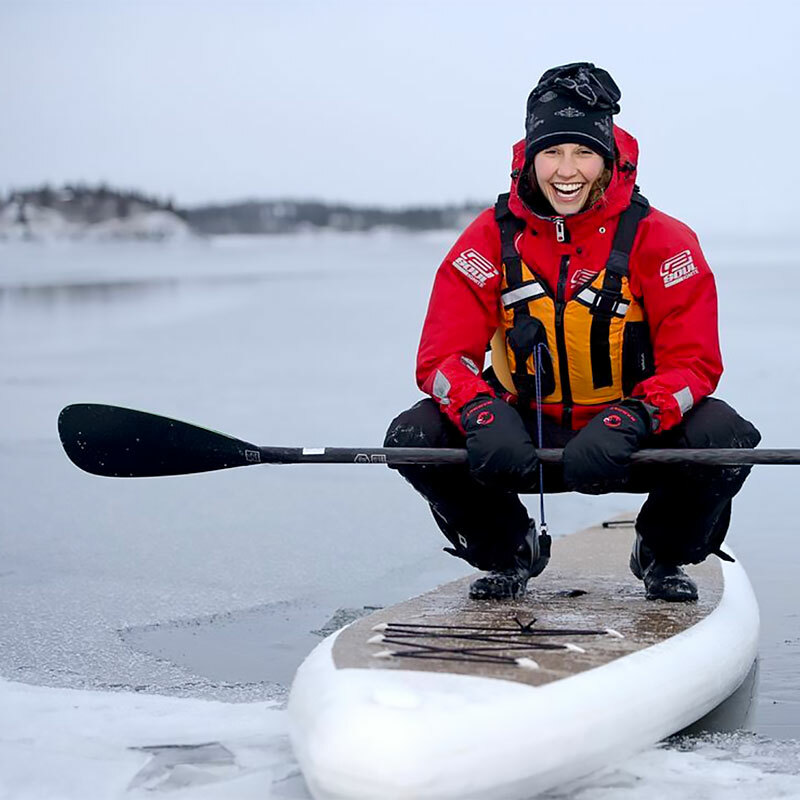 Michelle Eshpeter is from the Yukon Territory, Canada and is a specialist in cold-water paddleboarding. She is well-known for leading the first ever backcountry paddleboarding expedition in Glacier Bay National Park, Alaska. After that expedition, she was selected to be a test athlete in the stand up paddleboard category of the Yukon River Quest. This was the first year the organizers of the 715km paddling event welcomed paddleboarding athletes. Of the 10 athletes selected, Michelle finished as the second woman and sixth overall. She is an Advanced Flatwater Instructor for Paddle Canada and is also certified in Coastal Touring. To balance out her paddling, Michelle also studies wine and yoga. She has been training as a wine professional through the Wine & Spirit Educational Trust, and is currently WSET Level 2 certified. She has completed her Yoga Alliance approved 200-hr Teacher Training, and uses her skills to teach community yoga classes, competitive sports teams, kids yoga in schools and to lead retreats. While we have a carefully planned schedule, each trip may differ slightly, depending upon wind and tides, weather conditions, paddling opportunities, and the goals of participants. Plan to arrive in Juneau, Alaska on a regularly scheduled Alaska Airlines flight at least one day prior to our trip departure. You will have the afternoon and evening free to explore the sights in Juneau. We have provided a list of suggested lodges and optional excursions. A long and exciting day awaits us. After breakfast (on your own), passengers are invited to come aboard Glacier Bear, docked at Auke Bay Harbor (ten miles north of downtown Juneau), by 11:00 am. The crew will welcome you at the dock and will assist you with getting your gear aboard Glacier Bear. The captain will introduce the members of the crew and provide a boat and safety orientation. Our paddleboard trip leader Michelle Eshpeter will review the goals of our eight-day paddling adventure. We'll quickly settle into our cabins, take a tour of the beautiful vessel, and begin our journey. This morning we cruise into the heart of the Inside Passage. We'll have ample opportunity to observe and photograph whales, marine mammals, birds, and other wildlife. Traveling by motor yacht, on paddleboards and by foot allows us to closely experience this elaborate ecosystem. After departing Auke Bay, we cruise west past Shelter Island and around Mansfield Peninsula, the northern point of Admiralty Island. Admiralty Island is a vast wilderness, preserved as a National Monument. The Funter Bay State Marine Park is a magnificent reserve which includes beaches, old growth forest, muskeg and fen, as well as the historic grounds and structures of Point Retreat Light. The location was initially established as a navigational light in 1904. In 1924, Point Retreat Light was upgraded a new combination lighthouse and fog signal. In the 1950's the lantern was replaced with a solar-powered lens. In 1973 the light was again unmanned and downgraded to a minor lighthouse. We round the point and turn south, entering Chatham Strait. Our destination is Pavlof Harbor, nestled within Freshwater Bay on the southeast coast of Chichagof Island. Our evening anchorage provides the perfect opportunity for our first paddle. After our initial instruction from Michelle, we’re on the water, polishing our paddling skills in the protected waters of Freshwater Bay. Keep an eye on the shoreline for coastal brown bears. Pavlov Harbor is a photographer’s dream. Several brown bears can often be observed fishing in the rapids and small waterfalls of a small river that empties into the harbor. After a hearty breakfast this morning, we'll start our day cruising south past Tenakee Inlet. A visit to the charming community of Tenakee Springs (schedule permitting) provides a getaway like no other. We’ll hang out with local artists at the café and soak in the 105-degree therapeutic hot springs. We’ll soon need our cameras and binoculars. In this area of Chatham Strait, humpback whales often catch herring and other small schooling fish using a technique called bubble-net feeding. Unique to humpbacks, bubble-net feeding requires a group (pod) of whales to work together cooperatively. Whales gather in formation below large schools of fish and begin releasing bubbles, which confuse the fish and bunch them tightly together. The cylindrical wall of bubbles acts like a net, which fish are reluctant to swim through. On cue, the entire group surges upward through the bubble net, mouths agape – a dozen or more humpback whales all rising to the surface in unison. Each whale collects a huge mouthful of water, and then expels it, straining the fish through its baleen. Often the group will display this feeding behavior over and over again. Soon we pass Peril Strait, named by Russians because of a fatal incident during a fur seal hunting expedition led by Alexander Baranof in 1799. Baranof employed Native Aleut hunters, who ate mussels which were infected with paralytic shellfish poisoning from the strait, resulting in the deaths of approximately one hundred and fifty Aleuts. Before long, Kasnyku Falls can be seen plunging into Waterfall Cove along the east shore of Baranof Island. The falls drain from Kasnyku Lake. By mid-afternoon, we’ll arrive at Warm Springs Bay. A natural hot springs is located slightly above the powerful rushing waterfall. Baranof Warm Springs is the small community within Warm Springs Bay, at the outlet of Baranof Lake and the Baranof River. There are natural outdoor hot pools, and a public bath house which features three separate tubs and communal hot springs pools. A boardwalk takes us through the flora and fauna to picturesque Baranof Lake. Today we'll continue our journey to Red Bluff Bay, where we'll view dozens of waterfalls. Red Bluff Bay features a high ridge on the eastern coast of Baranof Island with Chatham Strait. The cliffs are brownish-red in color, due to presence of certain heavy metals, including iron, chromium and magnesium. We enter the bay through a very narrow waterway, turning frequently, and find ourselves in a secluded jewel of a fjord, with an open meadow at the end. We encounter dozens of small waterfalls, and a single large waterfall that roars into the bay. Steep mountains surround us on all sides. Our evening anchorage is near the western end of the bay. Today we’ll have ample opportunity to paddle and explore the fjord. Short paddles, long paddles, we’ll do it all. We’ll even be able to maneuver our paddleboards to within thirty feet of a massive 2,000’ waterfall. It’s a great photo opportunity. Are you ready to stand on land and stretch your legs? Let's go for a walk on the shore! It’s just a short distance by skiff or paddleboard to the west end of the fjord, and the surrounding rainforest of Sitka spruce trees. Two small streams, separated by a meadow roughly one hundred yards wide, empty into the bay. We frequently see brown bear sows with their cubs in this area, foraging along the shoreline. After an early start, we'll continue our journey. Today’s destination is The Brothers. We'll cruise east through Frederick Sound, passing the southern shore of Admiralty Island. Small pods of transient orcas are often seen along the way, showing us their large dorsal fins as they pass by. We smell their fishy breath as they surface, spouting through their blowholes. As we cruise along, we'll start looking for larger pods of humpback whales, this time exhibiting a number of varied feeding behaviors. Some choose bubble-net feeding, swimming in circles while blowing bubbles to form a curtain to corral in a mass of tiny fish. Others practice lunge feeding, breaking the surface at a 45-degree angle, mouth fully open, and throat cavities expanded like an accordion to collect all the fish scooped up by the lunging maneuver. We often catch a glimpse of brown bears fishing in nearby salmon-filled streams and rivers. With the largest concentration of nesting bald eagles in the world, Admiralty Island offers many chances to also see Canadian geese, trumpeter swans, cormorants and blue herons found in the fringe habitats between the forest, muskegs, meadows, and along the shore. Throughout the day, we'll watch for breaching whales, fast-moving pods of orcas, Dall's porpoises, and a variety of sea birds. Soon we observe an idyllic setting known as The Brothers, to the southeast of Admiralty Island and Pybus Bay. We'll pause to view a colony of Stellar sea lions, crowded on the rocks of tiny Little Brother Island. The males vie noisily for dominance over their harems. The sounds of nature drift in across the evening calm. Beautiful, remote and protected from outer waters, our anchorage at The Brothers is pristine wilderness — and the perfect place for a hike or paddle. We’ll anchor in an idyllic cove between East Brother and West Brother Islands, where the sounds of breathing whales, grunting Stellar sea lions, and screeching eagles drift in. During an extra-low tide at The Brothers, various anemones gleam brilliantly. The choice is yours — hiking or paddling? Or both? Verdant green moss covers the forest floor of East Brother Island, while rocky West Brother Island features a profusion of wildflowers and tidal pools. During an extra-low tide at The Brothers, various anemones gleam brilliantly. After a relaxed breakfast, Glacier Bear is underway once again. Today our destination is the entrance to the Ford’s Terror Wilderness Area. Two arms provide access to the wilderness area: Tracy Arm and Endicott Arm. We’re cruising toward a small cove, nestled safely inside of Holkham Bay, at the entrance to Endicott Arm. The entrance is the centuries-old terminal moraine of Dawes Glacier. Throughout the day, we'll watch for whales, sea lions, Dall porpoises, orcas, and sea birds. We'll pause to view a colony of Stellar sea lions, crowded on the rocks of tiny Sail Island, and pass by Five Finger Islands Light. As we continue cruising, we'll watch for breaching whales, bubble-netting whales, lunging whales, fast-moving pods of orcas, and darting Dall's porpoises. We'll change course and begin heading north through Stephens Passage, with Admiralty Island to our west (left) and the mainland to the east (right). And we’ll continue watching for Dall's porpoises, whales, orcas, and sea birds. Our destination this evening is a small cove, nestled safely inside of Holkham Bay. Wildlife abounds throughout the area. Our evening anchorage provides a great opportunity for a quiet paddle, and a beautiful sunset. The evening light is beautiful, as we dodge icebergs and wind our way into Holkham Bay. While our guests are enjoying breakfast, Glacier Bear gets underway in the early morning hours. We have planned our day to make the slack tide across Wood Spit and then journey into Endicott Arm. Along the way we'll be alert for drifting icebergs, as well as occasional humpback whales and orcas. Our day-long cruise takes us into the Endicott Arm, a narrow fjord that twists and turns through towering mountains. Massive glaciers have carved their way through these coastal mountains. Waterfalls drop thousands of feet off the granite mountains, and sapphire-blue icebergs serenely float by in the emerald green water. We'll continue all the way to Dawes Glacier at the ice-choked end of the fjord. Extraordinarily blue and beautiful, this glacier is famous for its active calving, and we’ll linger at the face of the glacier with the hope to witness gigantic chunks of ice breaking away. We'll also paddle through iceberg-laden waters and observe the antics of the many harbor seals hauled out for a rest on the ice. The glacier continues rumbling and thundering. Like the explorers here before us, the majesty and awe of this ice-carved land has etched itself into our memories. Sometime in the early afternoon, we'll reverse directions. If time and conditions permit, we may hike up a newly-formed valley on the north side of the fjord, just recently uncovered by the receding North Dawes Glacier. The icy glacial outwash river divides a meadow and scree slope and features a big waterfall. Black bears commonly come down to the meadow to graze. We'll take in the magnificent vistas and listen for the mournful howls of wolves. We’ll proceed to Fords Terror, one of the most spectacular anchorages in Alaska. There are several places to explore by paddleboard or skiff. Surrounded by 3,500-foot granite faces, we marvel at the mist clinging to the precipices. We'll make our way through the tidal rapids at slack water, into the majestic and stunning inner fjord. We cautiously paddle throughout Ford's Terror, as we slowly wind our way into a T-shaped terminus. We are in a vertical world of granite cliffs and glacier-carved cirques. Dozens of waterfalls cascade down their slopes, emptying into the turquoise waters of the fjord. Our evening anchorage is near a delightful waterfall. Black bears often visit the area near our anchorage, grazing on the abundance of berries in the meadows, and fishing for salmon in the stream. After a relaxed breakfast, Glacier Bear is underway once again. We have timed our departure to make the slack tide across Wood Spit. We are initially bound for Sanford Cove, near the Sumdum Islands. Sanford Cove is the abandoned site of the mining community of Sumdum. Not much is left of the town, other than a few pilings. This is prime salmon-spawning habitat, which lures brown bears to the creeks and rivers in the area. We hike along the banks of tiny Sanford Creek, through an old growth Sitka spruce and Douglas fir forest, to a stunning waterfall, illuminated by the morning light in a remarkable grotto of ferns and mosses. The scenery changes dramatically, as we leave behind the granite cliffs of Ford's Terror Wilderness. Our evening destination is Taku Harbor, a natural, bowl shaped harbor that was once home to a major salmon cannery. The 700-acre marine park is located on the eastern shore of Stephens Passage, about 22 miles southeast of Juneau. Taku Harbor is frequently used as a night anchorage by commercial fishing boats and small tour ships. Taku Harbor offers lots of fishing and crabbing opportunities. We’ll explore the small cabins and abandoned buildings in Taku Harbor, and gear up for a quiet, reflective paddle inside the safe, protected waters. It has been an amazing week of new friends, new challenges, and unparalleled scenery on our 360-mile journey. Tonight, we’ll celebrate the many memories we have shared. Our eight-day journey concludes today. This morning we cruise back to ”civilization” in Juneau. We'll head north through Stephens Passage, arriving around 1:00 pm at Auke Bay Harbor, just north of Juneau International Airport. Juneau is the state capital of Alaska and was named after gold prospector Joe Juneau. With views of island-studded waters, and stately spruce forests reaching to the water's edge, bustling Juneau is considered one of Alaska's most idyllic seaside towns. The scenic community is nestled between forested mountains and the waters of Alaska's Inside Passage. The population of Juneau is 32,406, making it the third most populous city in Alaska, after Anchorage and Fairbanks. Between May and September, Juneau's daily population can increase by up to 6,000 people from visiting cruise ships. There's plenty to see and do around Juneau, especially in the thriving downtown district. In the early evening, join us in the lobby of the Westmark Baranof. You'll be able to catch an Alaska Airlines flight tomorrow from Juneau, with connections to Seattle. Our Paddleboarders Speak Highly Of Us! Absolutely in awe by this entire experience. I had some expectations, and all were exceeded. I learned so much, saw more than I could have imagined, and have never eaten this well in my life. As fun-packed as it was, it was just as relaxing. Five-Star all around. Would do this all over again in a heartbeat. Thank you from the bottom of my heart. Amazing! Thank you so much for this wonderful experience. Will be hard to beat for sure. Neil – Great captain. Awesome skills getting up close to everything. Al – thanks for keeping us warm with fresh towels and hot tub. Michelle – you are an awesome teacher. An amazing person. Thank you so much. Katie – your talents as a chef, I have no words. Good luck in your future career. You will make an incredible nurse practitioner. Adriane – Thanks for making us laugh and making us all look great in the photos! On our amazing eight-day Alaska Paddleboard Adventure, we'll experience hiking and paddling in the Inside Passage of Alaska. On our journey we'll see charming fishing villages, an incredible array of wildlife, and breathtaking scenery. We use RouteBuilder to provide our guests with a map of our anticipated route of travel. RouteBuilder is a handy way to draw up custom routes, and estimate the distance we'll travel on each of our trips.